Points Nécessaires : 5900 Veuillez noter que, pour l'instant, vous ne pouvez pas télécharger du contenu à partir de notre plate-forme directement sur un appareil mobile (téléphone, iPod, iPad, tablettes ...). Vous devez télécharger vos articles sur un PC ou un Mac, puis de les transférer sur votre appareil de façon normale. Nous travaillons à autoriser le téléchargement direct aux périphériques mobiles, mais ce n'est pas possible dans la version actuelle de la plate-forme. Désolé pour le dérangement! NOTICE: Activation key must be used on a valid Steam account. Requires internet connection. 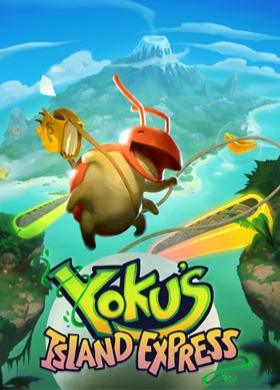 About the game	Yoku has arrived on Mokumana and he’s ready for the easy life, soaking up the sun and delivering parcels on a tropical paradise!However, an ancient Island deity is trapped in a restless sleep - and it’s all down to Yoku to traverse the island using a unique blend of pinball mechani… cs, platforming and open world exploration, in an amazing adventure to help those in need!Flip and bump our pint-sized protagonist around the stunning hand-painted island on your quest to rebuild the post-office, and wake an old god from its deep slumber. Key Features OPEN-WORLD PINBALL ADVENTURE: Coupled with its unique pinball platforming play style, Yoku’s Island Express offers non-linear gameplay that gives you the freedom to choose your own path across multiple questlines. WELCOME TO MOKUMANA ISLAND: Seamlessly Explore multiple regions of the island, including tropical beaches, lush jungles, snowy mountains, mysterious caves, and steamy hotsprings! UNLOCK THE AMAZING NEW ABILITIES: Help the friendly locals and earn a range of fantastic new power-ups! Vacuum explosive slugs and wake up sleepy villagers with the Noisemaker! CAPTIVATING STORY: Meet a cast of unforgettable characters across multiple storylines - whilst uncovering the islands deepest secrets. And maybe rebuild the post office too! EPIC BOSS BATTLES: Get ready to take on giant bosses using Yoku's trusty ball to 'deliver' the final blow. BEAUTIFUL ARTWORK: Feast your eyes on the breathtaking, hand-painted artwork created by games industry veteran artists. System Requirements Windows - Minimum Requires a 64-bit processor and operating system OS: Windows 7 Processor: Intel i3-2100 @ 3GHz / AMD A8-5500 @ 3.2GHz Memory: 4 GB RAM Graphics: Nvidia GeForce GT 630 2GB / AMD Radeon 7770 2GB, 2GB VRAM or higher DirectX: Version 10 Storage: 3 GB available space Additional Notes: Graphics card with 2GM VRAM or higher required. Yoku's Island Express. Developed by Villa Gorilla. © 2018. Yoku's Island Express and Villa Gorilla are trademarks or registered trademarks of Villa Gorilla. Published by Team17. © 2018. Team17 is a registered trademark of Team17 Digital Limited. All other trademarks, copyrights and logos are property of their respective owners.